Diptych. Each panel is 600 mm wide. Currency Converter ($675.00) Convert USD EUR GBP NZD Loading Sorry, there was a probem with the currency conversion. Please try again. 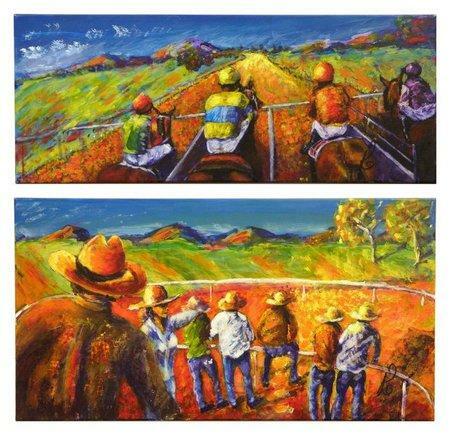 "The faces of Australian workers, miners, stockmen, aboriginal people and their customs, the outback, the red dirt, and Oh! of course always romance, fascinate me. "Born in Kalgoorlie, had my babies in Darwin, worked in the Pilbara, the Kimberley, and the Gascoyne - red dirt is in my blood, and people are always in my mind, so that is what I paint."